A white elephant gift exchange is a low-stress, low-cost, high-fun way to connect during the holidays. It’s simple to organize, easy to participate, and gets a roomful of people laughing, chatting, and enjoying themselves. Here’s your complete guide to hosting a white elephant gift exchange to remember, from the initial planning to the very last turn. Inviting your closest friends guarantees a great time, but a white elephant is also the perfect chance to build connections with a broader group—think cross-generational family members or coworkers. A focused activity means everyone is included and there’s less pressure to make small talk, which can be stressful. Making sure all your guests are on the same page about what kind of gift to bring is probably the most important part of a successful white elephant exchange. This most often means a price limit—often $5, $10 or $20. The joy is in the unexpected elements of the game and the creativity of the gift, not the price tag. In fact, you can take money out of the equation completely and instruct guests to bring something they already own and won’t miss. Remind guests to wrap the gift—it doesn’t have to be fancy, but at the very least the gift should be hidden in a bag. Whether you include the giver’s name is up to you. Knowing who brought a particular present adds an element of strategy some may enjoy; however, skipping them adds surprise. If you’re feeling brave, you might even decide to make the gifts completely anonymous, emboldening your guests to select something they might not openly admit to. It’s a good idea to send invitations, however you do it, at least two weeks in advance so everyone has time to pick out the right gift. In addition to the date, time and place, don’t forget the guidelines listed above: price, theme (if any), wrap, and gift tags or no. Choose a place to display everyone’s gifts in plain sight. Ideally, you don’t want to pile them up—part of the fun is watching people check out all their options before choosing a gift. If you have enough seating for everyone, arrange the seats around a table. If you don’t, no worries—simply offer seats to those most in need and ask everyone else to sit in a circle on the floor and put the gifts in the middle. 1. Players draw numbers from a hat to determine picking order. 2. Player 1 chooses a gift from the pile, unwraps it, and shows it off. 3. Player 2 can “steal” the first player’s gift or choose another gift. 4. Remaining players do the same—either steal somebody’s gift or choose a new one. Once a gift is stolen, the player who was robbed gets to steal someone else’s gift or take a new gift from the pile. 5. Once everyone has had a turn, player 1 gets one last turn. They can decide to keep their gift or swap it with someone else’s. If they choose to swap, the player they swapped with makes the same choice: keep or swap. The game ends when someone decides to keep their gift instead of swapping. 1. No take-backs: You can’t steal a gift that was just stolen from you. 2. Three (or two, or one) steals per gift. 3. Three (or two, or one) steals per player: If a player has already been robbed, you can’t steal from them anymore. 4. No extra turn for player number 1. 5. No steals at all: Each player picks a wrapped present. Once all presents are chosen, they’re opened. Keep it ultra-quick and get on to the eggnog. The only thing that makes weird gifts even better is if they include an inside joke. It helps if everyone at the party is in on it, or at least can easily get it. For example, a box of waxing strips becomes “Craig’s Waxing Strips,” named in honor of the hairiest guy at the party or that cousin Grandma is always nagging to shave his soul patch. 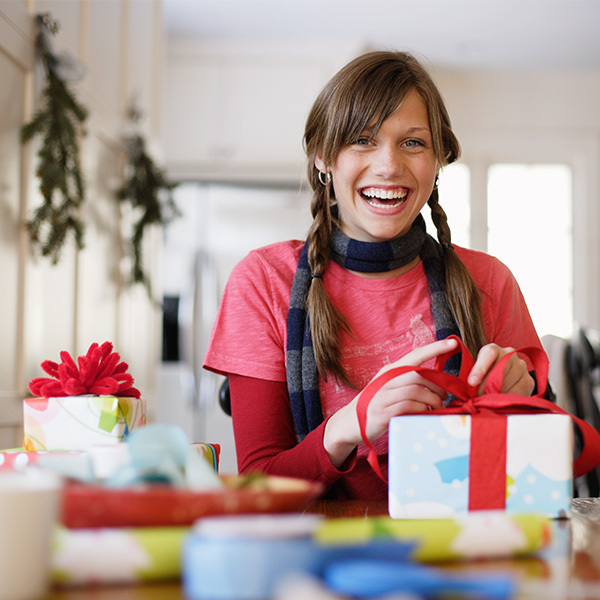 Not everybody has a knack for humor, and that’s OK. Often low-key, super-practical gifts keep things interesting by getting caught up in a stealing frenzy. Simple, can’t-miss gifts include food, booze, gift cards, a mini tool set (where’s a tiny screwdriver when you need one?) and lottery tickets. If you’re a baker, knitter, crafter, woodworker or something-else-er, nothing beats a one-of-a-kind present. It might not be a Bob Ross chia pet, but it will last in the heart and home of the recipient. And isn’t that what the holidays are all about? We’d love to hear your favorite white elephant gift exchange stories. Tell us about your favorite gifts, marathon exchanges, and most memorable moments by tagging @HallmarkStores in social media.